Warm daytime temperatures helped kickstart May but conditions quickly turned cooler by mid-month with one night falling below freezing. Unsettled but mild weather dominated for the rest of the month with many days having, sun, cloud and rain in just a few hours thus producing numerous rainbows. Given the mild start to spring, leaves did burst out on most trees by the second week of the month – the earliest in recent memory. 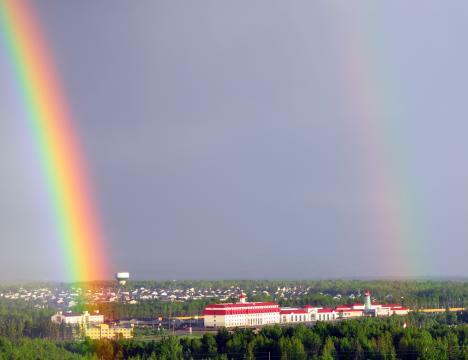 Not a single snowflake was recorded in Moncton during May and despite bouts of wet weather, rainfall was slightly below normal. 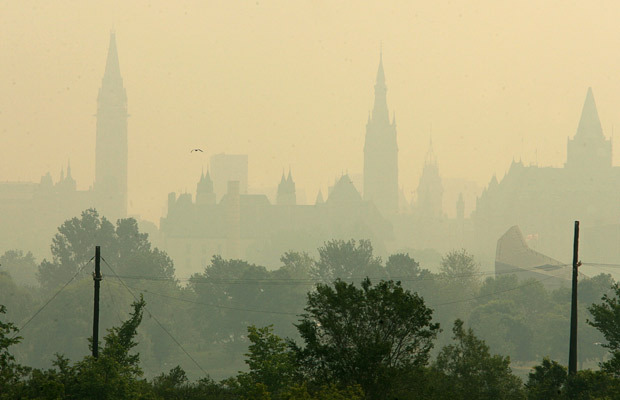 Montreal and Ottawa are shrouded in forest fire smoke today which has drifted east from blazes burning across Quebec. Police have been overwhelmed with 911 calls from residents wondering where the smoke is coming from. Smog alerts have been posted for Montreal and the plume of smoke has drifted as far east today as Boston and Cape Cod, Massachusetts. Greater Moncton could see some of that smoke over the next day or two. The heat is on in NB! The early heat wave of sorts continued in New Brunswick yesterday – eleven weather stations recorded temperatures of 30 C or higher. Greater Moncton Airport recorded a high of 29.8 C, shy of the 1977 record of 32.2 C.
The hotspot was Fredericton Airport at 31.1 C.
Today the heat lingered in Western NB where it hit 31.6 C in St. Stephen and 28 C in Fredericton but it was much cooler in Eastern NB where Moncton was 18.4 C and Miramichi was only 13 C! Hot in SE New Brunswick! At 28.1 C yesterday, it was almost considered hot in Greater Moncton – and surprisingly it was not much cooler at nearby Parlee Beach. Although it has been pleasant this spring in Southeast New Brunswick, this is the first real heat of the season. 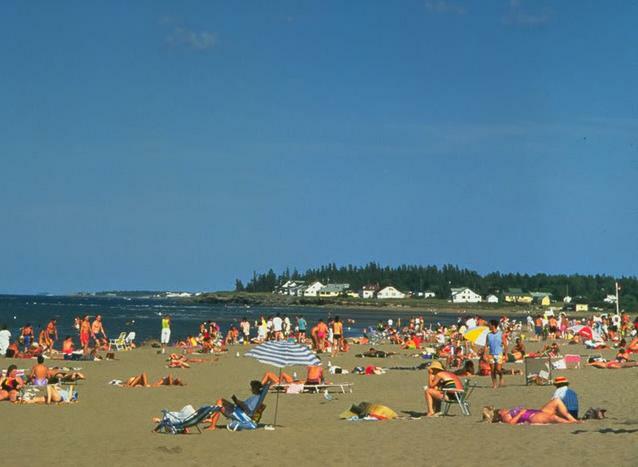 Parlee Beach was the busiest I’ve seen in a long time – granted this is the Victoria Day long weekend. The water is still very cold and it won’t be that comfortable for swimming until at least July. Lilacs have to be my favourite blossoms of the spring season. 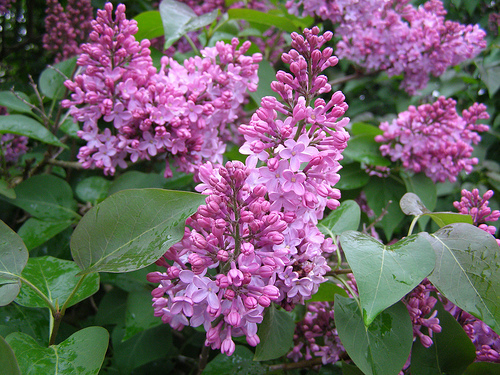 I love the fragrance of the lilac and this year, the season is about two weeks earlier than usual. Typically blossoming in early to mid-June in SE New Brunswick, lilacs are already coming into bloom. Unfortunately the blossom is short-lived, lasting only two or three weeks. 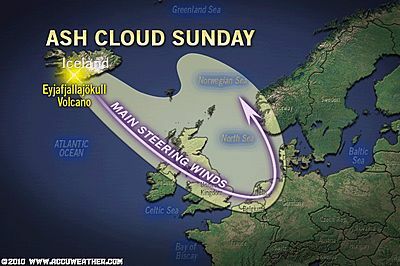 The Icelandic volcano is at it again… spewing ash which thanks to winds is being carried over the UK, Scandanavia and parts of the European mainland. Travellers at airports across the UK and Germany over the next few days should be prepared for the possibility of delays or cancellations. The Eyjafjallajokull volcano first started erupting in mid-April and subsequently grounded flights across Europe for almost a week. Periodic delays and cancellations of flights have followed since that first week following the initial eruption. “Temperatures will drop to near 2 C overnight tonight resulting in patchy frost. 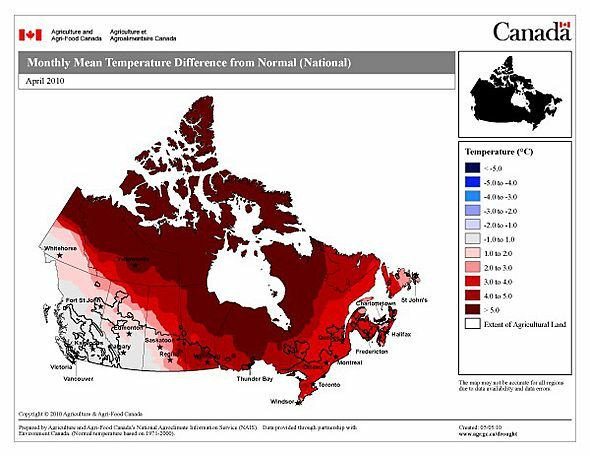 Environment Canada only issues frost warnings during the normal growing (frost-free) season in a particular region. UPDATE – No frost was reported in Greater Moncton as the temperature fell to relatively balmy 5.3 C.
Continuing a trend from March, the month of April across Canada was extremely warm. From the map above, temperatures were especially warm in the far north and in Northern Ontario and Quebec. 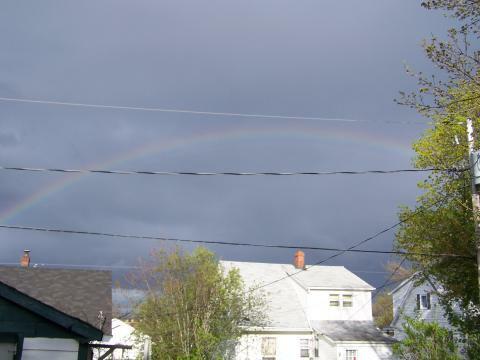 In Greater Moncton, temperatures were 3.3 C above normal compared to the thirty-year average. Well not officially but solar summer has begun. 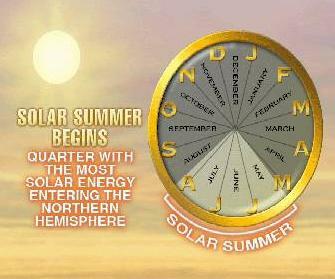 Solar Summer is the one quarter year with the greatest sunlight in the Northern Hemisphere. The period runs from the first week of May through the first week of August. 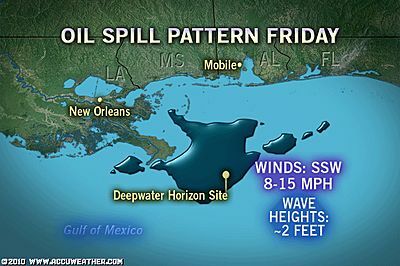 Light winds will translate to nearly calm seas into the weekend as crews move a containment system into place over the oil leak in the Gulf of Mexico. However, concerns of hurricanes and drift remain for the weeks and months ahead. The weather will cooperate as a series of domes is moved into place over the leaks via surface vessels. The rig Deepwater Horizon began spewing oil on April 20 following an explosion.